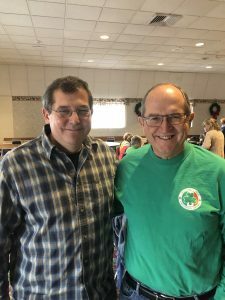 On Sunday, the St. Patrick’s Committee of Holyoke announced that Joe Morrison of East Longmeadow has been named the 2019 recipient of the Gallivan Award. The Gallivan Award is given to a Parade Committee member who, while not a resident of the City of Holyoke, has made significant contributions to the Parade and Parade Committee. Joe is a Special Education teacher at the Michael E. Smith Middle School in South Hadley. Joe is a twenty-two year member of the Parade Committee who has been active on many committees, including the Music, Parade Coordination, Raffle, Golf, and Road Race Committees. Joe currently serves as the Committee’s Financial Secretary. Born in Holyoke, Joe is a graduate of Holyoke High School, the University of Massachusetts where he received a BA in English and an M.Ed. in Curriculum Studies. He also received a second M.Ed. in Special Education, from Westfield State University. Joe lives in East Longmeadow with his wife Jenn (also a long-time Parade Committee member). They are parents to Daniel (22), Patrick (19) and Kelsea (12).